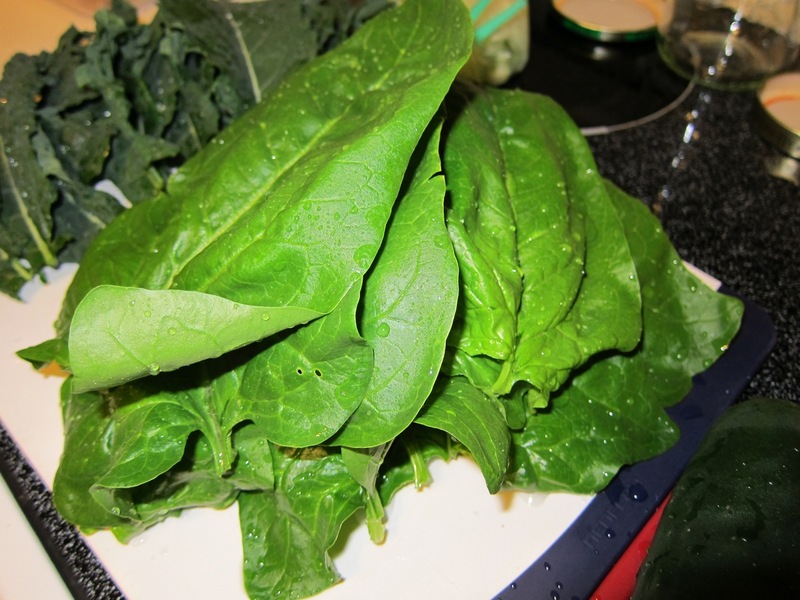 Last year, I had the hardest time growing spinach. This year, the spinach leaves are bigger than my hand! I like to pick them from the garden for an impromptu breakfast or snack. They’re also great added to salads and the juicer. I decided to post this podcast once I finished it, just so I’d have it up here. It’s for the third workout of Couch 2 5K’s Week 5. Remember that in Week 5, there are three different workouts, not the same workout repeated three times. Therefore, I had to make three separate podcasts with the voice from here. For this workout (if I manage to get to it, let alone survive it), you warm up 5 minutes, jog 20 minutes without stopping, and then cool down 5 minutes. I used music from Michael Bublé, Glee, Tangled, and TobyMac. My original podcast for Couch 2 5K’s Week 2 was made of Christmas music. Here’s a non-Christmas version. I used music from The Little Mermaid. The 6 intervals are for 90 minutes of jogging and 2 minutes of walking. There is also a 5 min. warm up and 5 min. cool down. The voice telling me intervals that I used in my podcast came from here. Eric to the Rescue con’s. 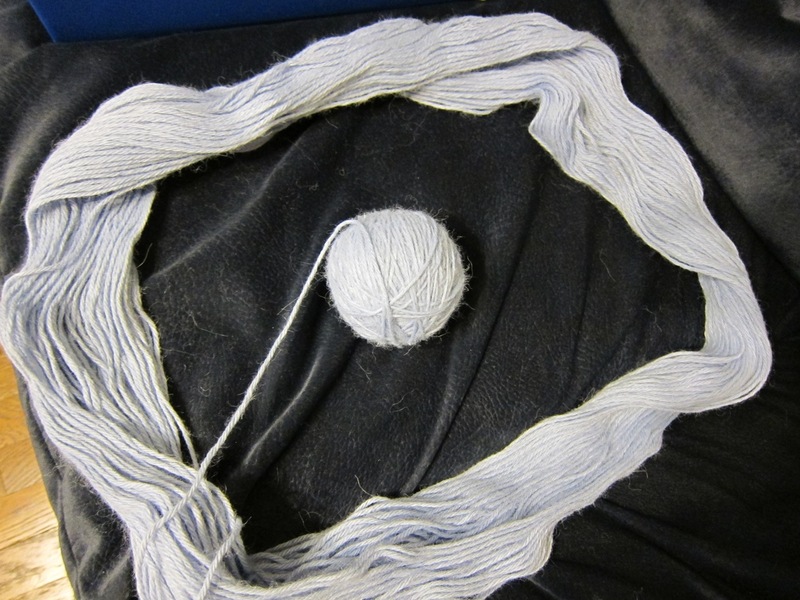 The last time I tried to roll a ball of yarn, I had a tangled mess. Luckily this time, I kept everything in a circle on the couch and it worked out well. It did shed all over the place, though. Thanks to my brother for the yarn! I don’t know what happened, but jogging has not been happening lately, at least not since the beginning of this month. It started to gradually go as I was only doing jogs on weekends, because I didn’t want to get on the treadmill and the only time I could go jogging out of doors (for my schedule, the weather, traffic, etc.) was on weekends. Then, I got a bad head cold, which I’m still getting over. Yes, I feel a bit out of shape. Yes, I think I’m avoiding doing longer runs (for me, 8 minutes of jogging without stopping is a long time). I’m really avoiding thinking about jogging 20 minutes without stopping (Couch 2 5K’s third workout for Week 5). I knew when I started Couch 2 5K (again) that I didn’t know how far I would get. I sure didn’t get very far the first time. Still, I was surprised that I got to Week 5. I think having podcasts with my own music helped. What do I plan to do? Once I’m completely over this head cold, I’m going to restart Couch 2 5K. I’ll go back to Week 1 (remember that it’s three workouts per week) and do one workout a day. Then, I’ll go straight into Week 2 (and so forth and so on). Since I did Christmas music for Week 2, I did a new playlist with non-Christmas music. I’ll post the playlist soon. As I get past Week 2 and into slightly longer jogging intervals, I might need to start spacing the jogs a day or so apart. I’m considering doing yoga or cardio/strength training workout videos in between jogging days. We’ll see. Anyways, I want to exercise on a regular basis again. I want to progress in my jogging so that I can jog 5K without stopping. It’s taking forever and I wish I were in the shape I was in 5 years ago. I guess if I keep at it and get myself eating a bit healthier foods, I’ll get there eventually. It may just take a while! 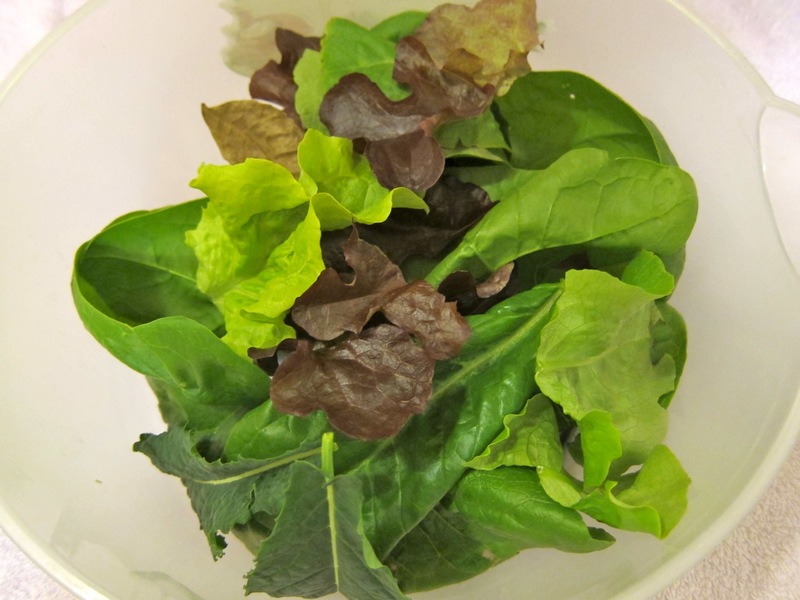 Here are some of the greens (butterhead, romaine, Farmers’ Market blend, kale, spinach) from my garden that I picked for a lunch salad. I added chunks of mozzarella, some sliced carrot, and some fajita chicken. No dressing was needed! Yum! 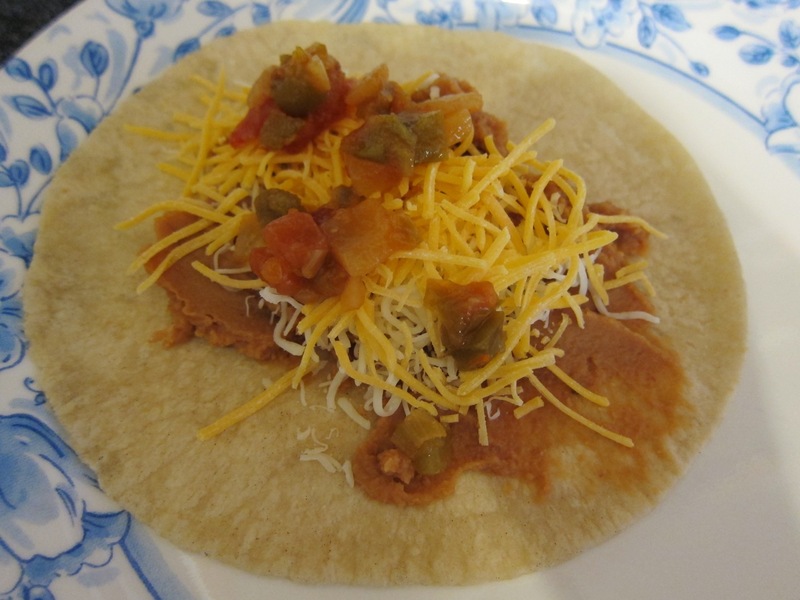 I decided to make some bean and cheese breakfast tacos. After slightly warming the tortillas so they wouldn’t break when I folded them, I put a little of everything on them. 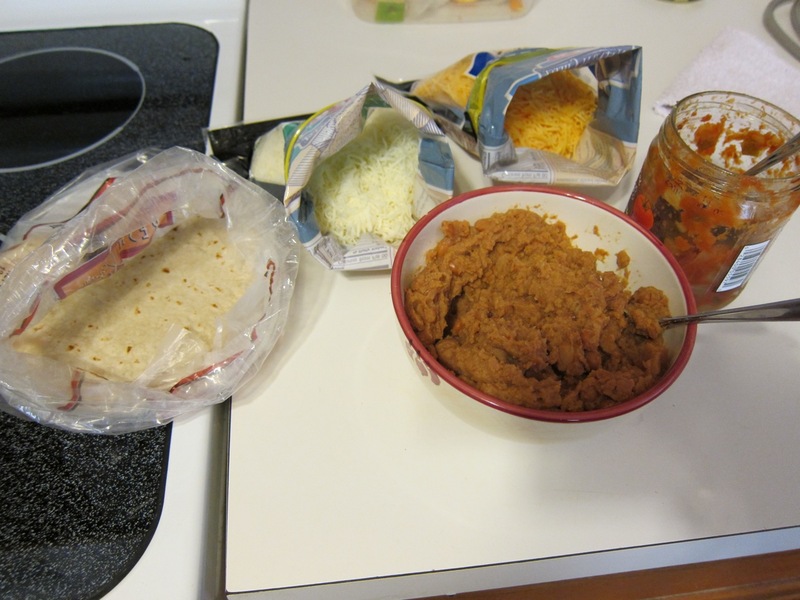 I spread out the beans to go on all 10 tortillas. 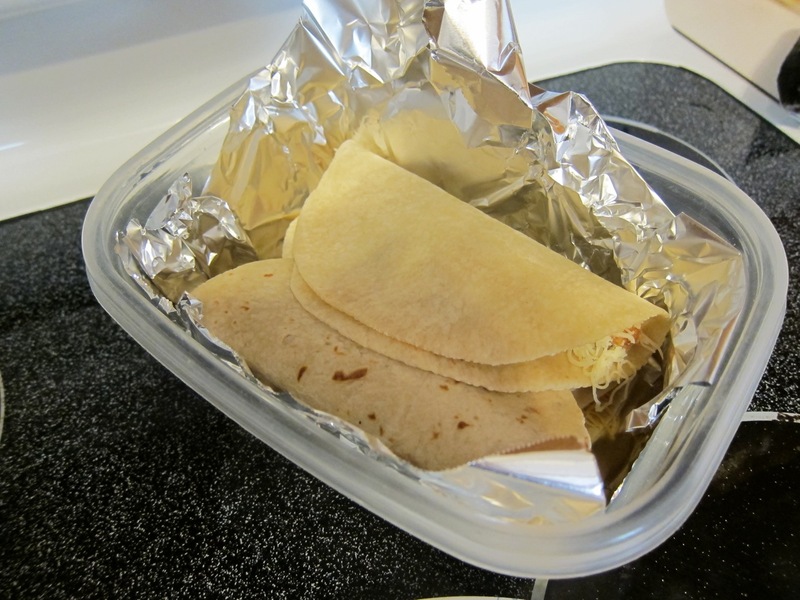 I folded them in half and placed them in a plastic food container lined with aluminum foil. Then, I stuck them in the freezer. Warm them up for about 90 sec. (for two) and you’ve got a great breakfast!